Photo: Gono Forum, led by Dr Kamal Hossain at a press conference at the Jatiya Press Club in Dhaka on Saturday, Mar 23, 2019. 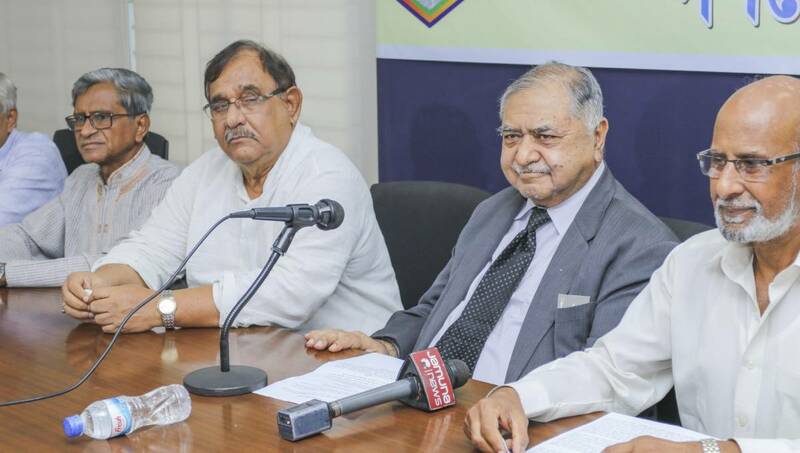 Dhaka, Mar 23 : Gono Forum, led by Dr Kamal Hossain, on Saturday demanded that steps be taken to free the transport sector from political influence and laws be properly to restore disciple in the sector. The party came up with the demand at a press conference at the Jatiya Press Club in Dhaka. “Political influence not only helps corruption spread but also make people indifferent to obey law which ultimately hampers the rule of law. This is applicable for all sectors, including the transport one,” said Dr Kamal Hossain. Dr Kamal, also the convener of Jatiya Oikkya Front, said police must enforce laws so that the goal for which these are framed can be achieved. But if the police are influenced by anybody then they become weaker, and deviate from the rule of law.